Incoming three-year olds (by 8/15/2019; must be fully potty-trained) through kindergarten. 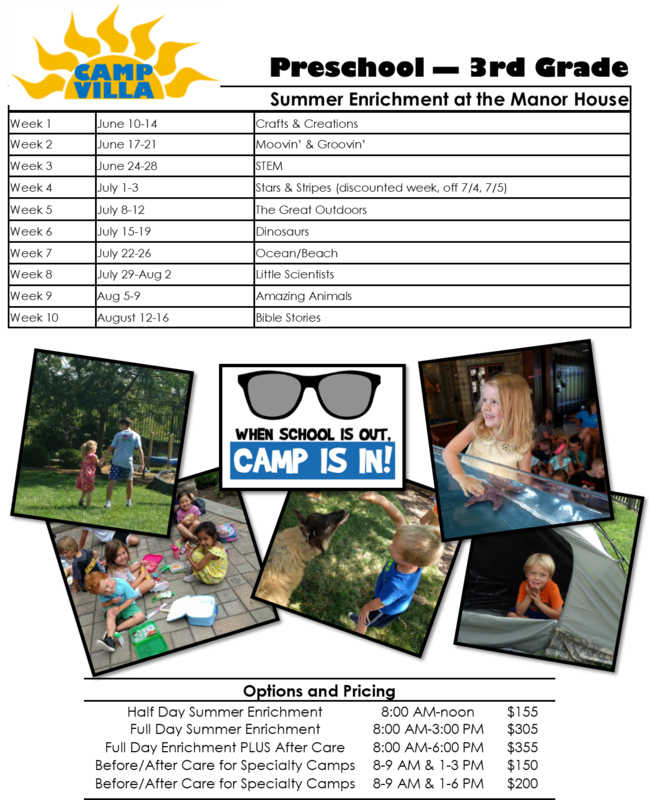 1st-3rd graders are also welcome if childcare is needed, but may prefer the specialty camps in the morning. Many 1st-3rd graders join in at 1:00 after their specialty camp. Be sure to send their summer workbooks! Manor House and grounds of St. Ursula Villa School. Registration will open February 6, 2019 and will be open throughout the summer. You can register for a week of summer enrichment up to the Wednesday before the week of camp. Snacks and drinks will be provided. Attendees must bring a nut-free lunch. There will be no refunds or reductions in fees for partial attendance or late arrivals/early dismissals. Expectations for student behavior are in keeping with the policy of St. Ursula Villa during the school year.